In Rome in 2015, The Institute for Religion and Critial Inquiry held its first major seminar Laudato Si: The Greening of the Church? The seminar brought together leading international eco-theologians, Biblical scholars, ecological ethicists, and moral theologians, to explore the strengths, weaknesses and implications of Pope Francis's encyclical on the environment from a variety of ecclesial and academic perspectives. Professor Moloney presented a biblical response and we are privileged to have him give two biblical perspectives on this vitally important subject at St Peter's. 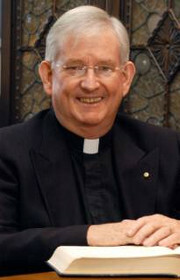 Professor Moloney, a founding editor of the Australian theological journal Pacifica, and an associate editor of The Catholic Biblical Quarterly, is the author of 36 books and a large number of articles, both scholarly and popular, in journals from all parts of the world. Of particular pastoral interest are: A Body Broken for a Broken People. Eucharist in the New Testament (Peabody MA: Hendrickson, 1997) and his three volumes on the Sunday Gospels, The Gospel of the Lord, Years A, B and C (Collegeville MN: Liturgical Press).